BeeCOS Business Website Creator (content and relationship management engine) is arguably one of the worlds most powerful website creation and content management software systems. Business Website Creator (cms & crms) enables you and your staff to easily create, design and manage your organisation's web presence in real time. Business Website Creator (cms & crms) enables you to build an active participating community of users through its range of content management and relationship management tools. This means that your website, intranet or extranet can deliver information and services to staff, customers or partners - and enables you to push your business to its next level of communications and services. This is all achieved via a seamless web based environment. Using leading technical and industrial security standards and the performance strengths of Sun Microsystems JAVA on the server side, Business Website Creator (cms & crms) offers a new engagement with technology - enabling organisations to develop powerful and professional web sites, and to undertake all manner of web-based strategies. On top of its technical and usability strengths, Business Website Creator (cms & crms) provides the best value in the marketplace today. Whether you run a large organisation with 3000 users, a medium business with 80 users, or a small business with five users, BeeCOS software is able to meet your needs in terms of functionality, licensing and cost. Business Website Creator enables the easy creation and management of website(s), in real time, without the need for expert web developers. You no longer need to use complicated third-party software applications to create your web pages. 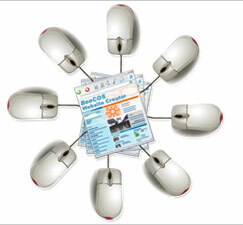 Best of all, Business Website Creator utilises the BeeCOS Web Engine technology framework. This software framework supports additional BeeCOS Modules such as customer relationship management, e-commerce management, database & survey management and e-marketing. These additional modules ensure you get much more than just a website. 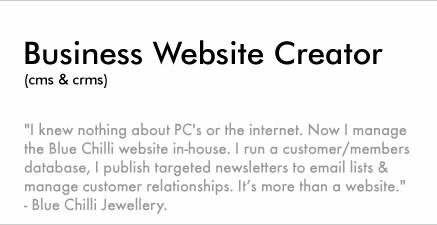 All modules seamlessly integrate into your Business Website Creator (cms & crms) system. Visually Rich Interfaces - "enhancing the user experience"
Business Website Creator enables you to create an engaging web environment from which to communicate, express, publish, manage and share information. This gives your business the opportunity to develop more meaningful and lasting relationships with both customers, partners and staff. Business Website Creator (cms & crms) brings an entire suite of industry leading functionality to you via a few secure clicks. Easy to use, the management interfaces ensure you complete your website and content management goals quickly and easily. With Business Website Creator (cms & crms) you can do what you want with the minimum of fuss and technical complexity. BeeCOS Business Website Creator (cms & crms) delivers results reliably, efficiently, anywhere, anytime. Above all it allows you to achieve your business goals and outcomes.